-Added quick access to the 5v5 Grand Battle. Enter a room in one tap and begin playing faster. -Moved claimable rewards to a new side bar on the left and to an icon on the top right to grant easier access to in-game rewards. -Redesigned the main screen to allow more space to showcase new heroes and skins. -The big buttons have been split into three buttons and moved to the bottom center. You’ll now find the Casual Match button on the left. -In the middle is the 5v5 Grand Battle. 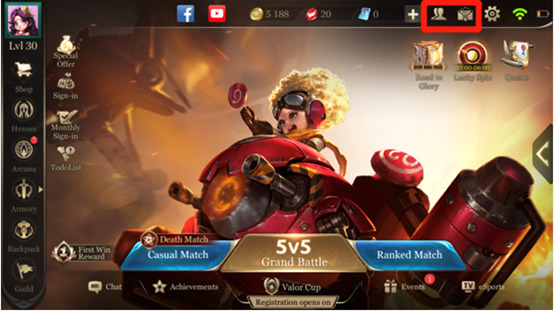 Tap it to enter a 5v5 room and quickly start a game. Ranked Match is on the right. The old Daily Battle Quest window is now the first icon (the box) at the top right. These are new systems where players will be able to get more rewards. We added a column of quick access icons on the left, mainly for special offers and sign-in rewards. These two systems have been moved from the bottom of the main screen to the top, beside the Settings icon. Access to the Valor Cup has been moved to the bottom center.